Lahore (May 24, 2011). 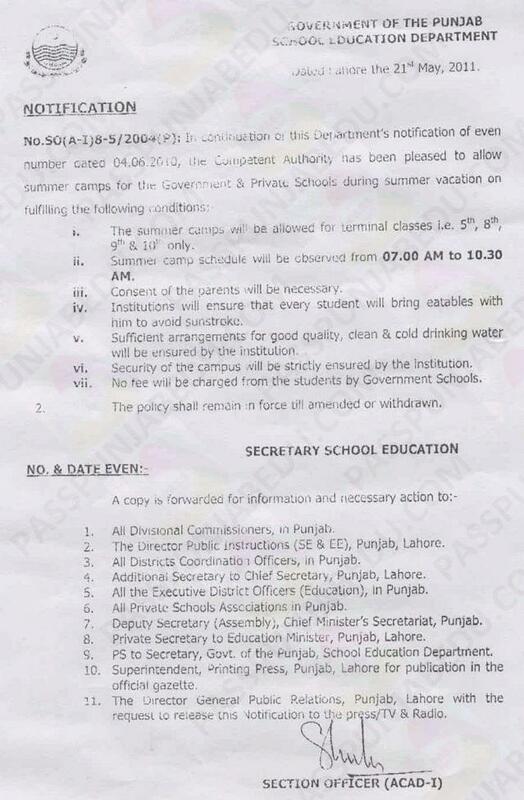 Punjab Education Department has issued notification regarding “Summer Camp” 2011.
iii. Consent of the parents will be necessary. Security of the campus will be strictly ensured by the institution. No fee will be charged from the students by Government Schools. The policy shall be enforce till! Amended or withdrawn. !. All Divisional Commissioners in Punjab. The Director Public, institutions (SE & EE), Punjab, Lahore. All Districts Coordination Officers, in Punjab. Additional Secretary to Chief Secretary, Punjab, Lahore. 5. All the Executive District Officers (Education), in Punjab. 6. All Private Schools Associations m Punjab. Deputy Secretary (Assembly;, Chief Minister’s Secretariat, Punjab. Private Secretary to Education Minister, Punjab, Lahore. Request to release this notification to the press/TV & Radio. bilkul sahi. Summer camps fazool hen. Jab student khud summer camp join nai karna chahta to zabardasti kiyoun????? fori sammar camp khatam kia jai hamara school main 10a and 10b ko chityan ho gi hain 10c ko chtiyan nai hoi koan?why problem? bhai jan spellings to theek tarah likh liya kren, ta k samajh aye. wese bi ap ne topic se alag kar reply kiya he. summer camp should not allowed because it is very Hard to come to school for teachers and students and these days are too hot,particularly for those who live in distant areas. Kis nay ya notification jarie kia ha?